I just got done moving into a new house, and wanted to show you what I had done to the gardens in my last house. The landlord was fine with paying for all of my gardening supplies, which is understandable since I was increasing the curb appeal of his home. 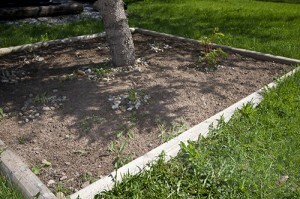 Here is a before (more like middle) photo of the back yard garden. There actually wasn’t even a garden there at all when we moved in. I had our landlord come over and cut the branches of that pine tree up to about 4 feet so I could put in a nice shade garden. I framed it and added a bunch of dirt and perennials. I used hostas and a bleeding heart, both of which are shade lovers. And here is the after photo of the backyard garden. Every plant came back this spring, even though I neglected to cover them last fall. 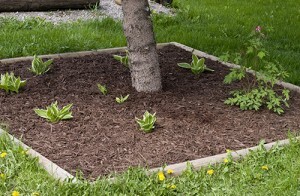 I pulled all the weeds out, added weed liner, and some brown organic mulch. Viola! I think they look pretty nice! It’s just too bad that I won’t be able to live there when they are at their peak. I guess I’ll just have to be a creeper and drive by to look at them. It’s so nice that even the simplest outdoor landscaping projects like these can make such a big difference in the look and feel of your yard. Putting these gardens in was surprisingly easy, but I think that they really added a lot to the house. Now that it’s finally warming up here, I’m on to finishing my containers and my vegetable garden! I’ll keep everyone updated!